Order champagne online and get a great delivery service straight to your door in minutes. 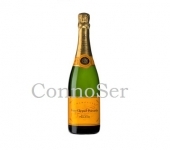 Ordering online offers you a quick and easy tasteful and chilles champagne takeaway. Redcurrant and apple-flavoured, creamy and light. Ripe apple flavors laced with vanilla and pecan. It is a subtle, drier-styled champagne, with a lime and vine blossom attack.